An ISO 9001:2008 – Certified Company, At Unipack we believe ‘Quality Is Our Business, Profit’s Are Our By–Products’. 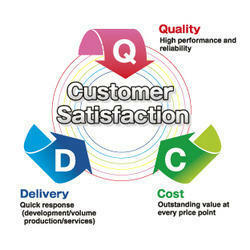 As a quality-centric organization, we strive hard to maintain the uppermost quality standards in our product range. We have hired an adept team of quality experts who meticulously examine the entire production process and distinctively check all the finished products on certain quality parameters to detect any kind of defect. In order to manufacture these products, we source optimum quality raw material from reliable vendors of the industry, which is also checked on various parameters before being sent to manufacturing unit. In his 28 years of action-packed journey, Jaipal has never left any stone unturned. “Now we are making fully automatic computerised PLC machines. We have manufactured products costing from Rs.300 upto Rs. 4 million. The growth is dedicated to sheer hard work, dedication, honesty and integrity,” he says proudly, Jaipal attributes his success to continuous improvement in product quality. “We are learners, and therefore undertake complete and continuous improvisation (Kaizen) activities. Also, there is absolutely no compromise on quality. You cannot gain market share if you compromise on quality. Our best teachers on quality are our customers and whatever may be their grievances, we go on improving. That is why we are recognized in the market, he adds. Being a client-centric organization, our foremost aim is to attain the utmost satisfaction of our esteemed clients. To attain the same, we never compromise with the quality of our products. Our professionals work in close proximity with each other to meet the exact needs of our customers. Further, these experts understand every minute detail specified by our clients in order to provide excellent quality products within stipulated time frame. Our approach and business dealing have helped us to garner a huge clientele across the country. Sugar Syrup Filtration Machine for Beverage Industry.